This post is not meant to be an exact how-to guide. I've detailed the main steps first. If you don't want to read those you can skip down to the gallery which is posted in chronological order. Warning: there are a lot of gaps in the progress shots. I tried to remember to take photos along the way but I missed a lot of steps. (Sorry, I was up to a deadline and had less than two weeks to create this and I was still working on the Loki armor at the same time.) That said, I completely forgot to take photos of the woodworking portion of this build. I started with a large plank of 3/4" select pine from my wood bin, I ripped it into 2 pieces and laminated those together. I printed out this photo of the actual prop to the scale of my daughter (who is significantly shorter that Tom Hiddleston) so the staff would be proportionate to her size. 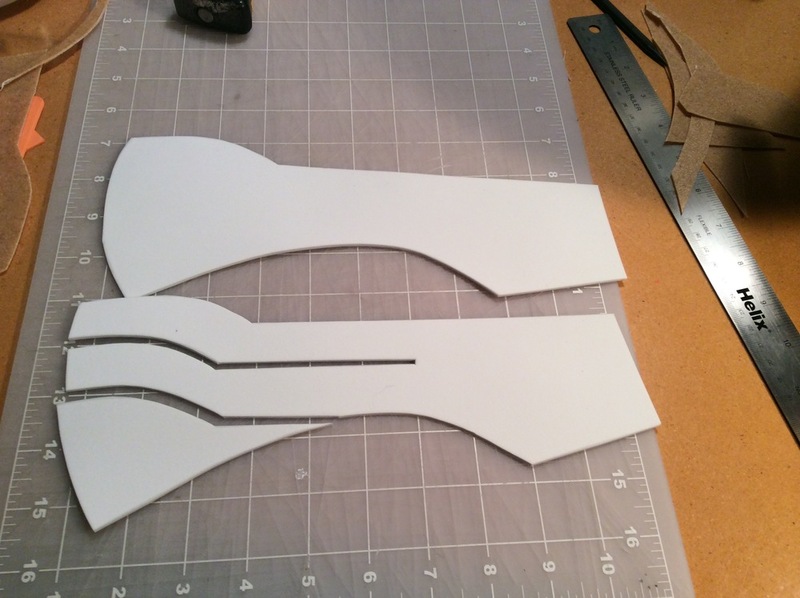 I cut out the print and used that as my guide for the staff and blades. The rest I just eyeballed as I worked. 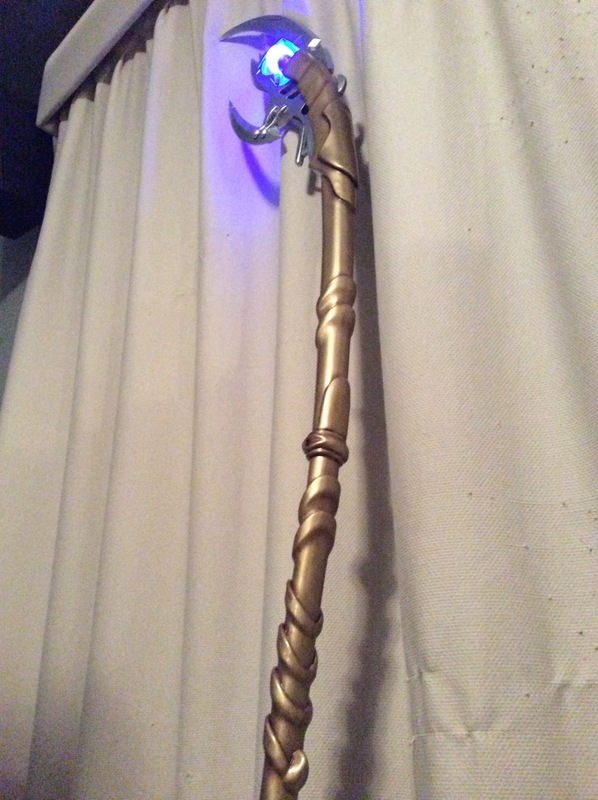 I used photos of this amazing staff created by Eldrich Arts for detailing reference. 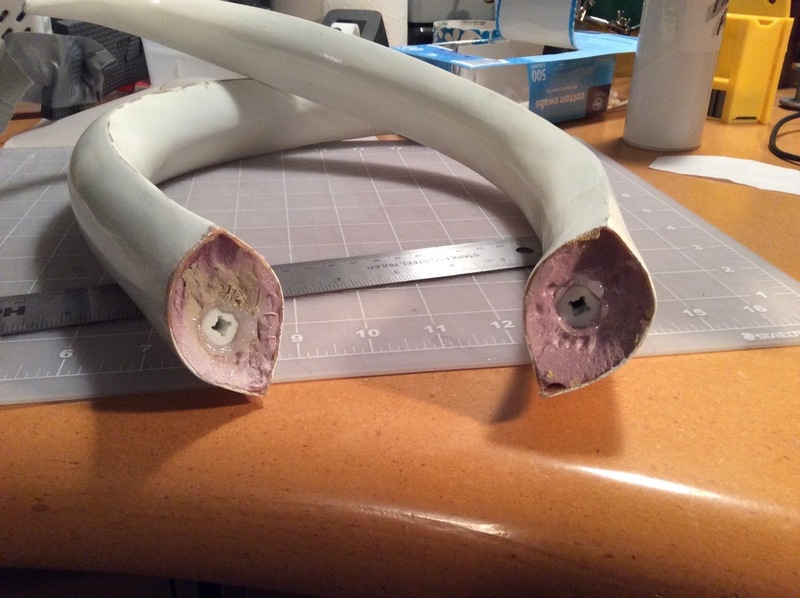 The details on the staff body are all Worbla which I cut into various strips and wrapped around craft foam to give it some thickness. I heated those strips and hot glued them to the staff. 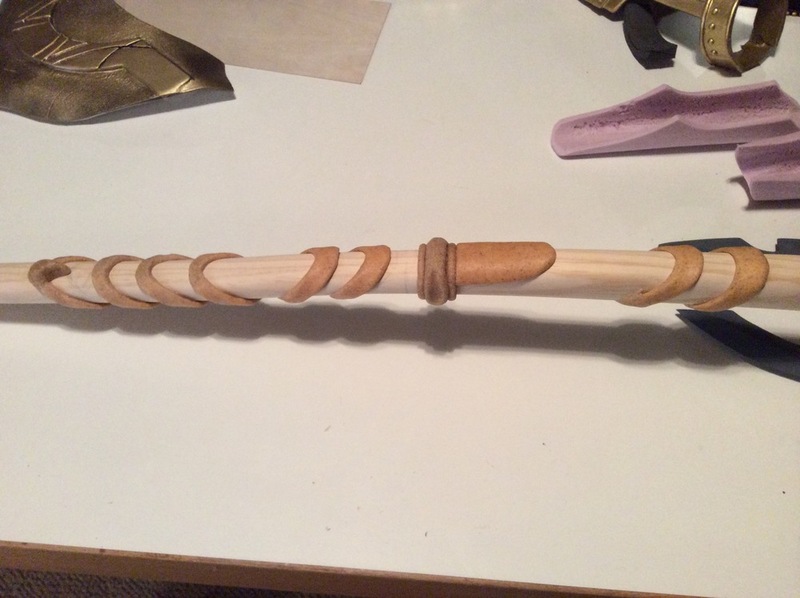 To create the flares I filled the "down-edge" with wood filler until it made a nice smooth transition to the staff body. 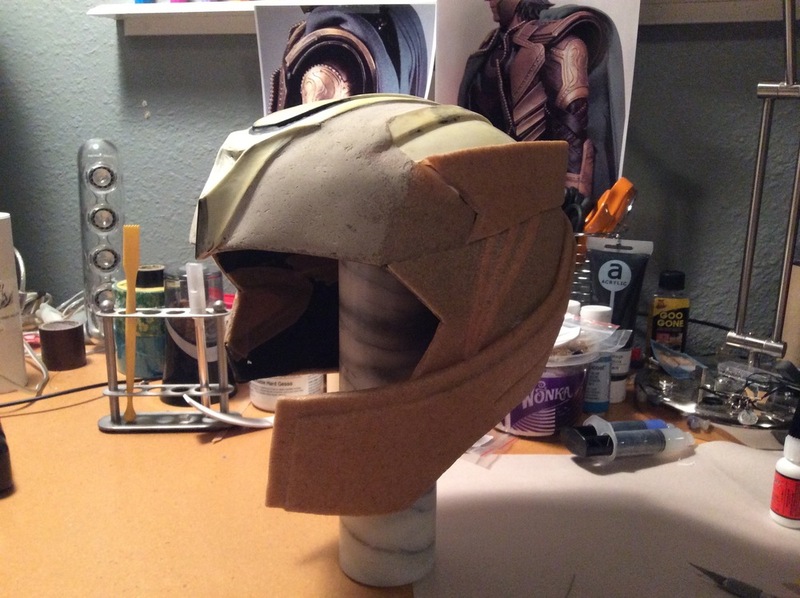 I later prepped the Worbla using my smooth finishing technique. 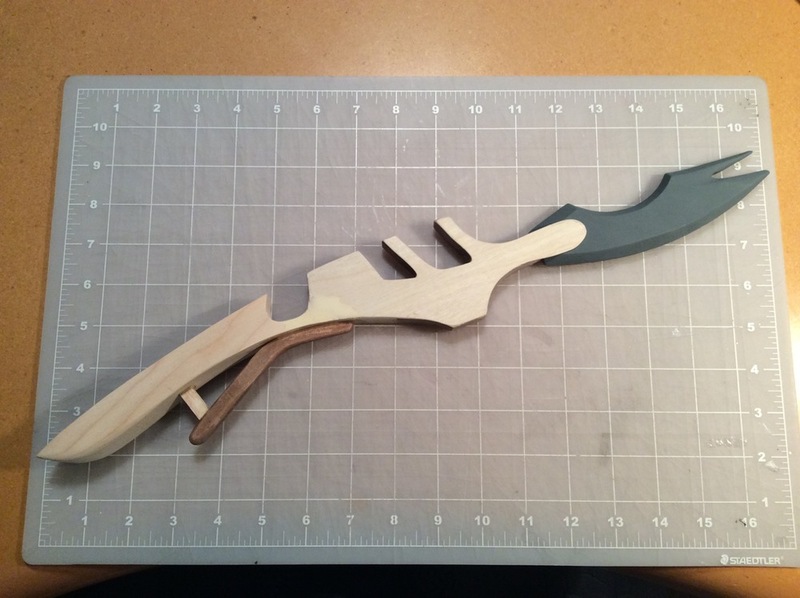 The blade assembly is made from pine and MDF. I shaped the tapered sides of it with my bench belt sander. 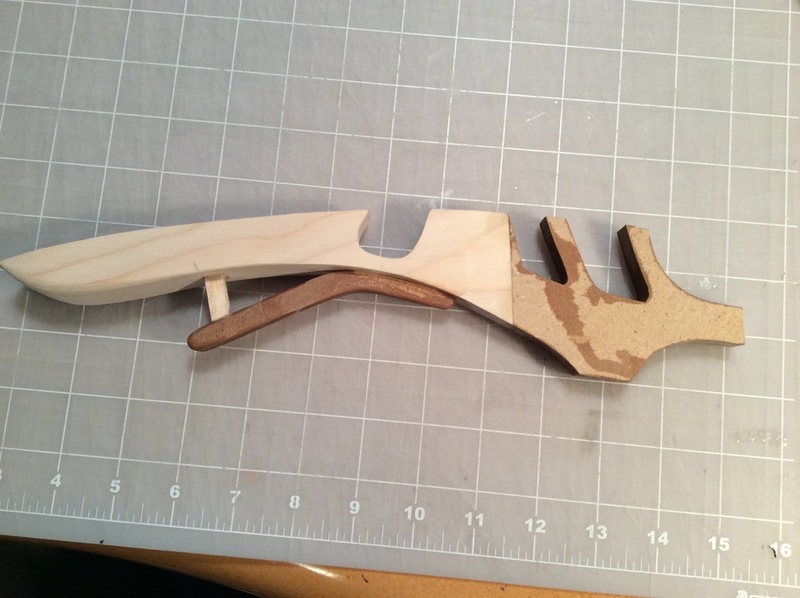 I then "skinned" each side with 1/32" birch plywood so I could approximate the "fingers" which are on either side of the middle blade and hold it in place. 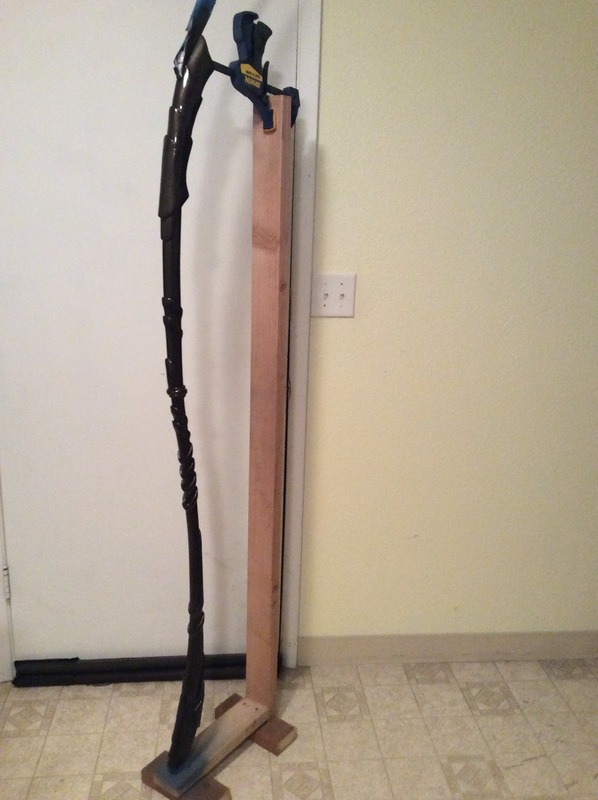 I shaped the top portion of the staff (which has three flares that the main blade connect into) out of pink insulation foam. Those were extremely tricky and time consuming as they were not only curved and rounded they also taper in width/thickness. Once I adhered them to the staff I covered them in Bondo and sanded them down. 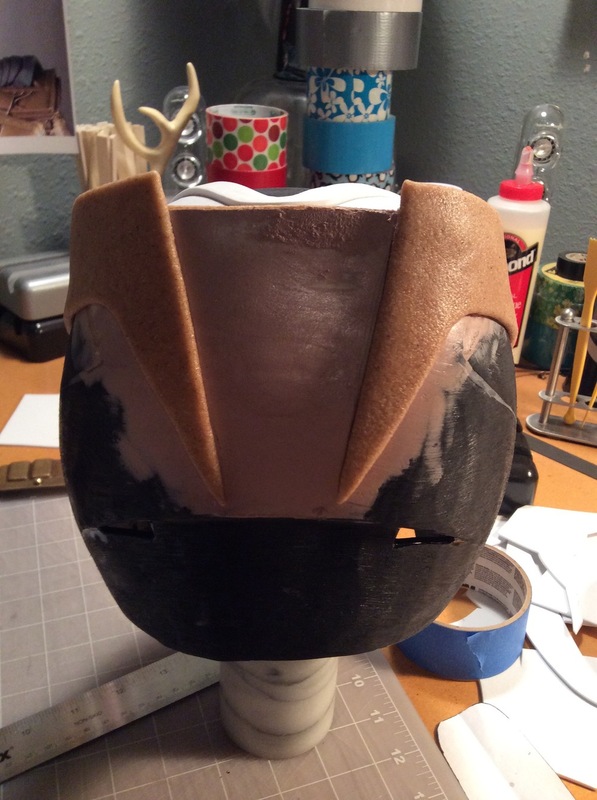 I ultimately was not happy with the Bondo so I skim coated them with Wood filler and got a better prepped surface. The orb is made from a clear plastic egg I found here. To make it more orb like I hit it with some 80 grit sand paper and my hand held grinder until I got the look I wanted. I wired it with three 10mm blue LED's and utilized the battery holder from an old LED glow-stick. 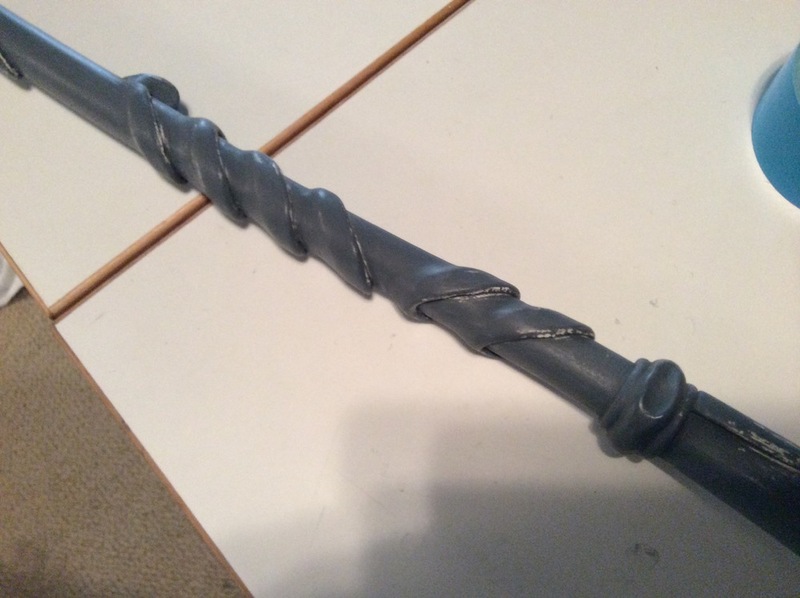 The coil that the orb is connected to was made from Worbla which I rolled out into a long snake then wrapped around pvc pipe. Originally I made the mistake of not coloring the orb blue also. Indoors the blue LED's looked pretty good so I wasn't concerned. We ended up doing a lot of outdoor photos at ECCC 2014 and the orb was totally washed out in the sun light. I have since painted it with watered down acrylic and it looks great on or off. Orb assembly. 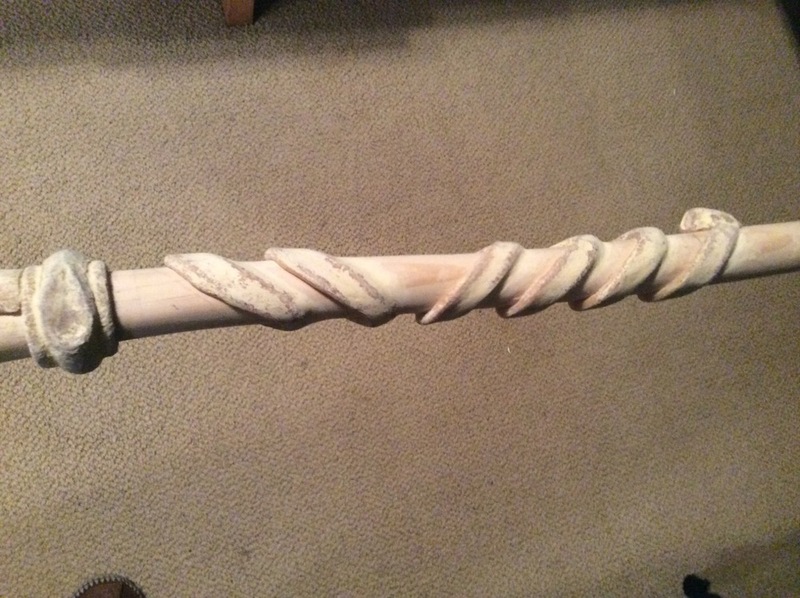 Made from a "rope" of worbla wrapped around the end of an LED glow stick. That covers all of the main parts of this build. This was actually a fun build other than the time constraints and I am pretty happy with the finished product. 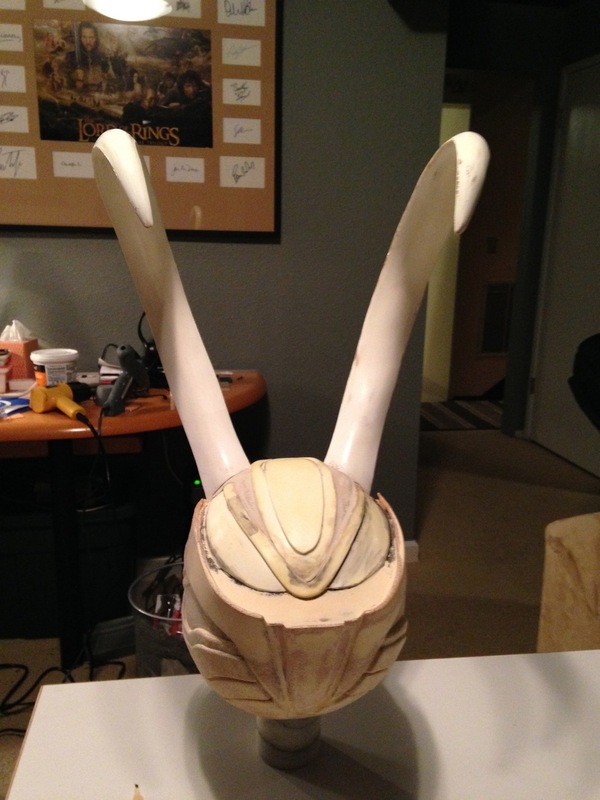 It's hard to tell because of the photo's angle but something about the shape reminded me of the Loki helm. 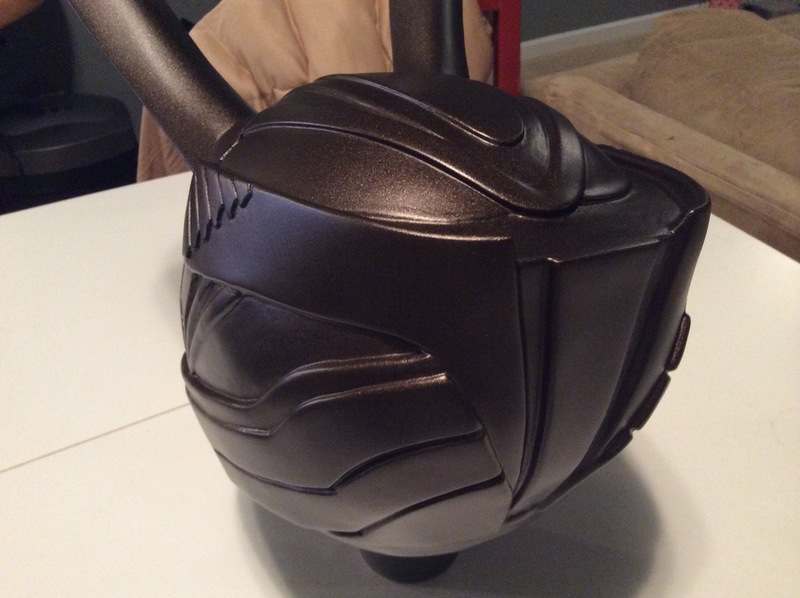 (I forgot to take picture of the actual helmet but this is a stock photo of the exact model.) 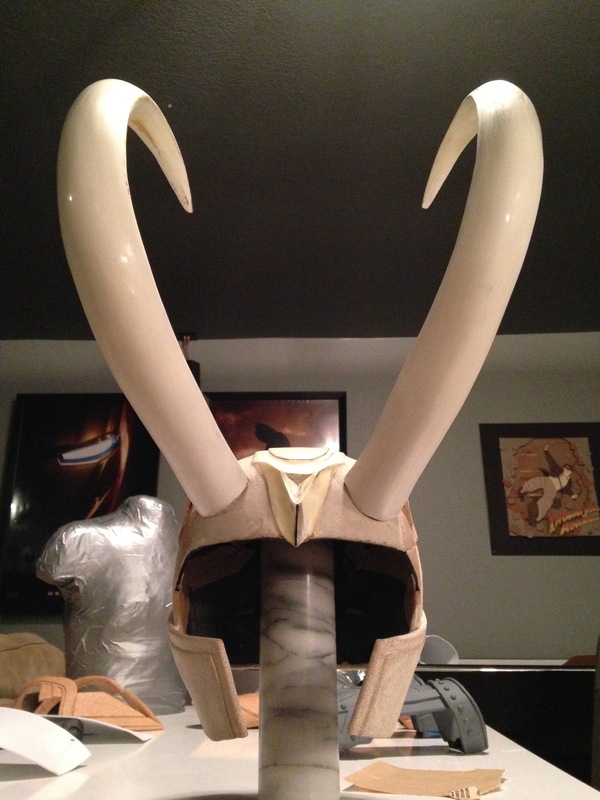 It hit me that maybe basing the Loki helm on a preexisting helmet would be a better place to start. So I bought the helmet for $6 and the rest follows. When I started modifying the batting helmet I was in a bit of a rush so I didn't take photos to being with. My progress photos start with the batting helmet already cut down and heavily modified. 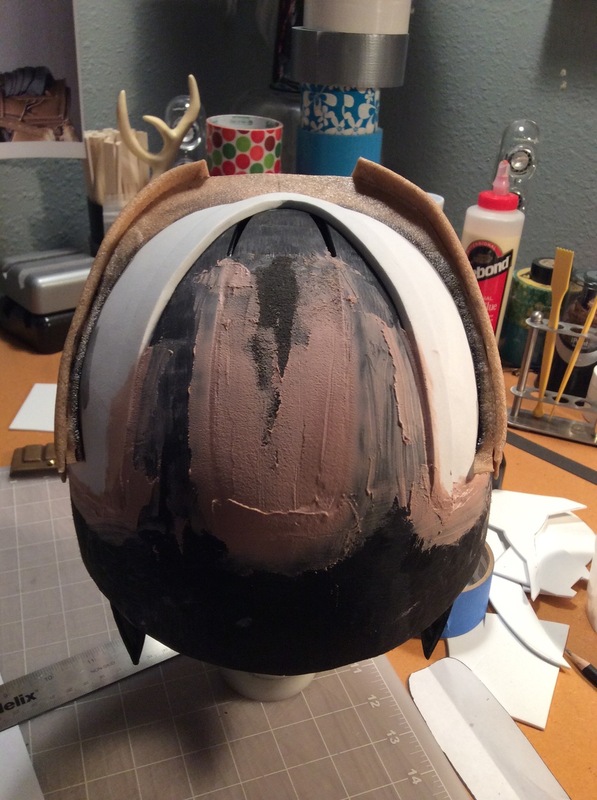 Besides removing the bill I also chopped out a part of the midsection, pretty much the whole part that is painted silver to compress the profile of the forehead. This post is not meant to be an exact how-to guide. What you'll find is a whole bunch of progressive photos of the build and painting prep process. I'm not done with the final painting. The photos stop at the first base paint layer. I'll add the painting photos when I'm done and satisfied. Thanks for reading this far. If you have questions please feel free to ask in the comments section. If you liked this post you can see my work in progress over at my Facebook page: Coregeek Cosplay and Creations which I update regularly as I build. I write these longer build posts after the project is finished. I'd appreciate you "liking" my page while you are there. I just learned a new word. Yup, I had no idea what a spaulder was until I looked it up. I was just going to call this piece the shoulder armor thingy but I figured there was a fancier armorers name. 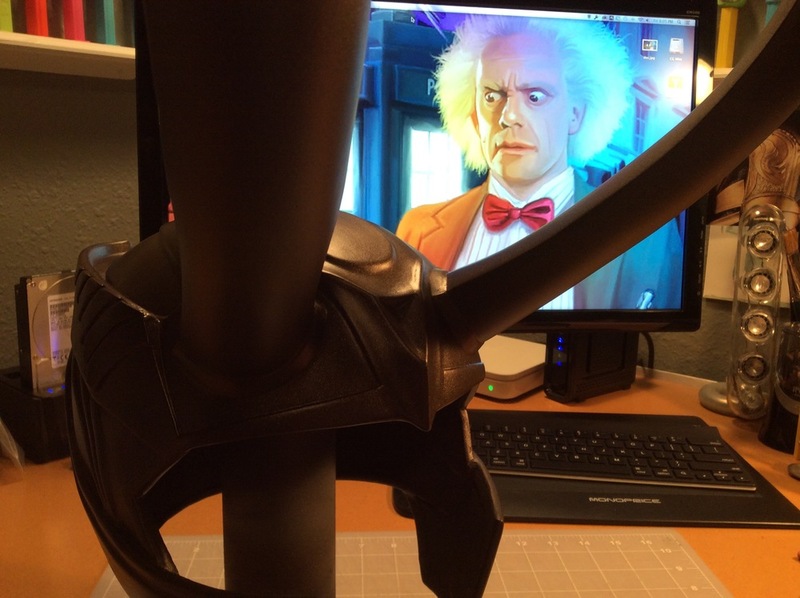 The spaulders are the first piece of the King Loki build I decided to tackle. Not sure why I decided to start there. Turns out they're quite complicated due to the need of being curved over the shoulder. For the most part I am happy with the progress so far. 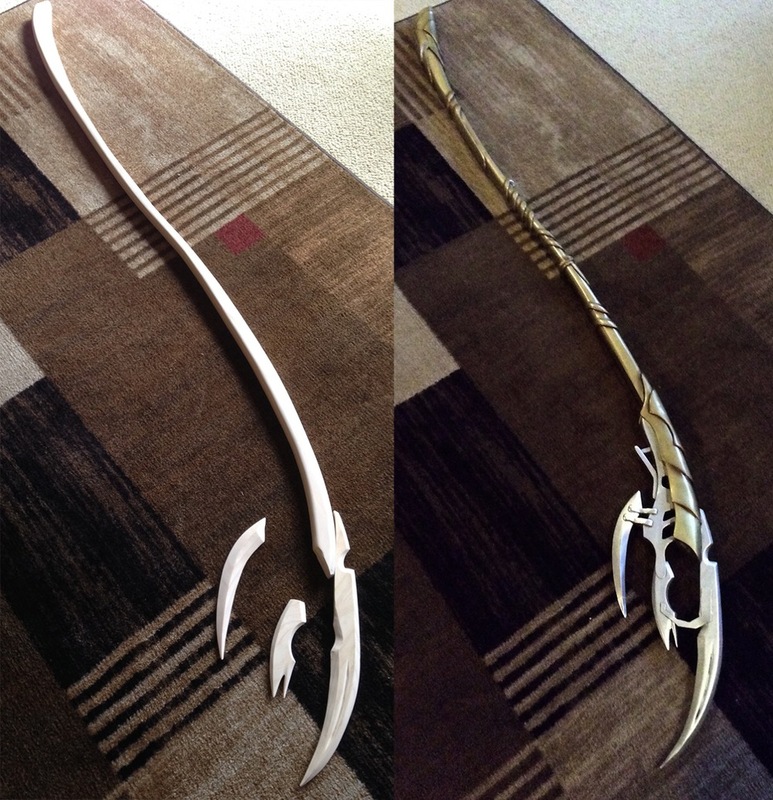 Worbla is so easy, yet finicky at the same time. 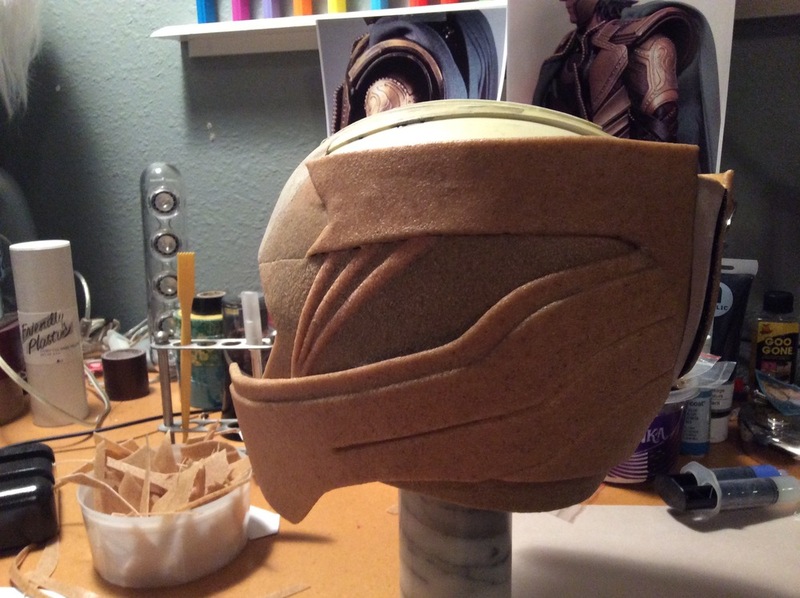 One thing I was not prepared for was the massive amount of prep needed to get Worbla's surface somewhat smooth. In my research I discovered most techniques involve many coats of either gesso, wood glue or primer. I used these to test what process I like the most. What I've learned is it really doesn't matter. If you want a smooth surface you're pretty much going to have to do a lot of sanding. My process was: 4 coats of spray on shellac, sanded with 120 grit, 2 coats of brushed on wood glue, rough spots sanded with 150 grit. Then 2 or 3 coats of Krylon primer 150 grit sanded between coats on the rough spots. Total PITA so I'm trying something different on the other to get the process down less. Some have just used 4-6 coats of wood glue but I really hate hand painting that stuff so many times. 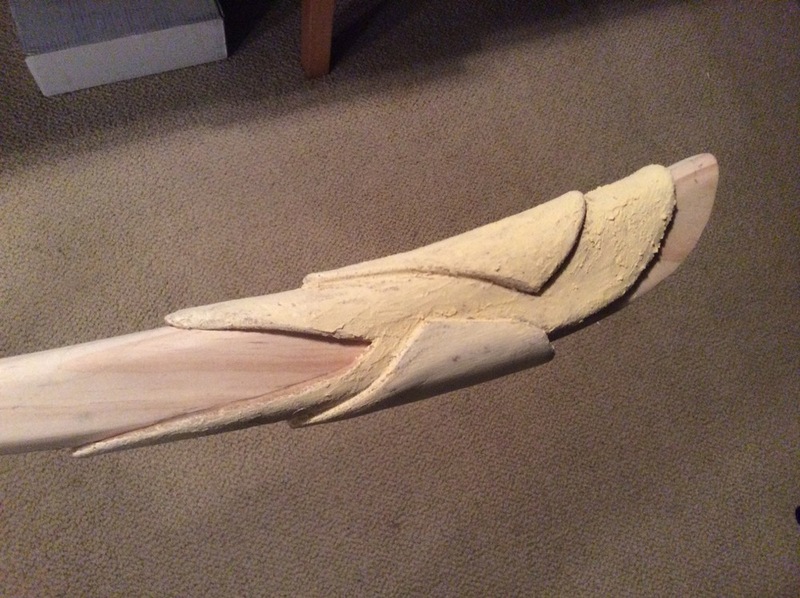 UPDATE: I've changed my method for getting a super smooth finish on Worbla since this was posted. Please see this info graphic for more info. The reason you only see one of the spaulders ready for paint is I've put off the second because it needs to be sanded and primed and sanded again. Ugh, I hate sanding. Paint base coat in dark metallic brown. 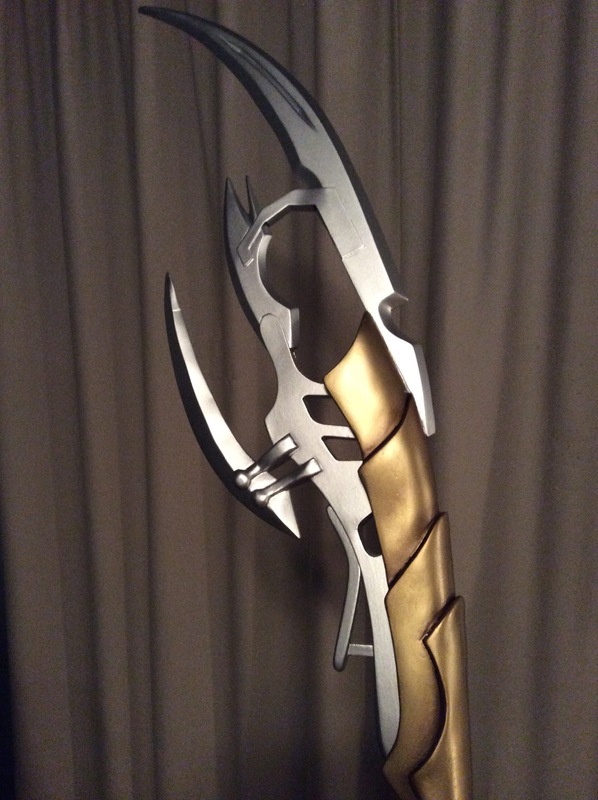 For building technique I pretty much followed the Worbla tutorials posted online by the amazing Kamui Cosplay. I also purchased a copy of her ebook which I highly recommend if you want her excellent info in an easy to read/research/return-to format. For the detail "rivets" I used these metal round domes. The domes are the perfect size but I was hoping the tacks would easily press into the Worbla; they don't. 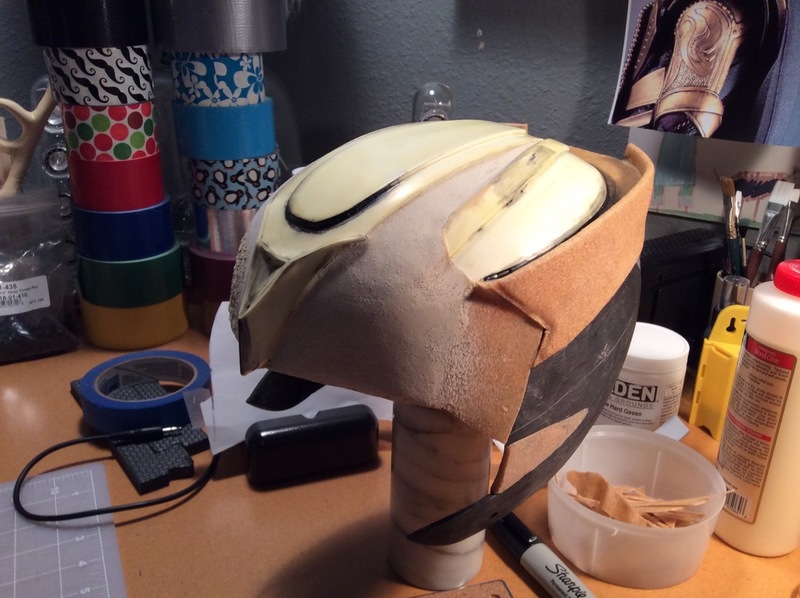 It would probably work fine if I was able to heat the Worbla, I can't because the heat makes the primer begin to lift. So instead I have to clip off every single one of those tiny little tacks then adhere them instead. The rest of the details were hand painted on with dimension fabric paint. I thought I took a picture of the spaulder after I applied the dimension paint and domes (prior to covering with primer) but I couldn't find it. Apparently I only thought of taking that specific shot. 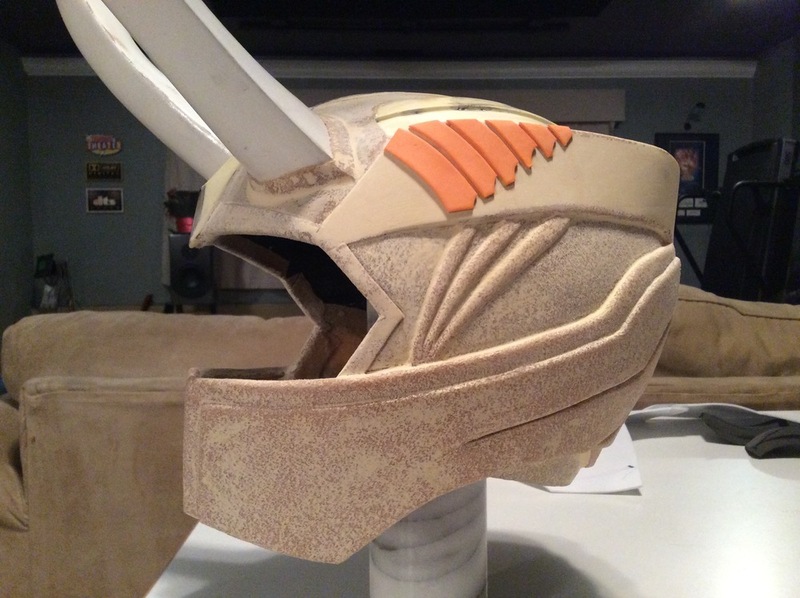 For those wondering you can order Worbla from CosplaySuppies.com. The stuff is not cheap but it is quite easy to shape and mold. Worbla adheres to itself, you can cut it with scissors, heat it up, shape it and once it cools it becomes hard plastic again. Pretty fantastic for armor building, if you can put up with the prep for finishing. Update: Discovered that my little project got a mention on the Facebook page for Cast4Art. Also I didn't realize I had comments turned off when I made this post. Comments are on now. So if you found my page and have any questions feel free to ask. One of my favorite things about building stuff is sharing ideas with others. 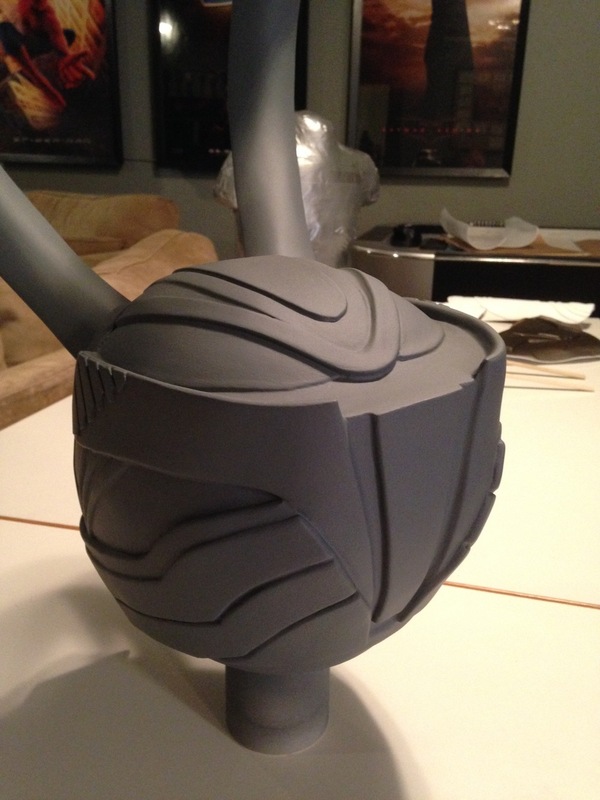 Body armor, helmet, cape, scepter, that's a lot of building. It's definitely going to push my creating skills and I'll get to learn to use some new materials along the way.